People are told to fade the chalk in daily fantasy sports but that proved to be quite literally untrue in Week 1 of the NFL season. Each week we will provide GPP recaps highlighting some of the lessons from the top DFS lineups. These would have been the optimal lineups spit out. Does the 22nd one look familiar? Of all the players in SkipBidder’s winning lineup, only four of them garnered lower than a 16.7-percent ownership: Ryan Fitzpatrick (1.1-percent), Kenny Stills (7.9-percent), DeSean Jackson (1.0-percent) and the Dolphins defense (5.6-percent). Otherwise, Alvin Kamara (35-percent), James Conner (29.9-percent), David Johnson (24.4-percent), Rob Gronkowski (21.6-percent) and Michael Thomas (16.7-percent) were all amongst the highest owned players on the slate (with Kamara and Conner coming in at one and two respectively). Essentially, the only bad chalk he avoided was Christian McCaffery and Chris Hogan and it is not like he went contrarian at the RB position instead. The key to winning the slate was stacking a game with the highest total of the entire weekend but stacking the contrarian side of it. Whereas Brees came in at 11.1-percent ownership, Fitzpatrick was barely one-percent owned, and he finished with a slate-best 42.28 fantasy points. When all said and done, Fitzpatrick completed a whopping 75.0-percent of his passes (21-28) for 417 yards and four touchdowns (TDs) while also rushing 12 times for 36 yards and a score. Both Mike Evans and Jackson caught 100-percent of their targets and the two combined to catch 12 passes for 293 yards and three TDs. Assuming you are the ones who did not win $1 million this week, seeing how conceptually simple winning was this week is tough to stomach. Chalk plus a stack from the highest scoring game plus Stills (who ranked as DailyRoto’s ninth-best value at the wide receiver (WR) position) plus a punt defense was all it took to win big. Again, this lineup focused on the chalk for the week, paired it with a Fitzpatrick stack and built around the premise of a cheap defense and solid value at the remaining position (Reed ranked as DailyRoto’s seventh best value at the tight end (TE) position). Emmanuel Sanders ranked as our 12th best value at the WR position and he came in at 13.4-percent ownership playing out of the slot against a depreciating Seahawks defense. This user was not a subscriber to our site but our projections were bullish on all of these offensive players and the strategy remained similar. 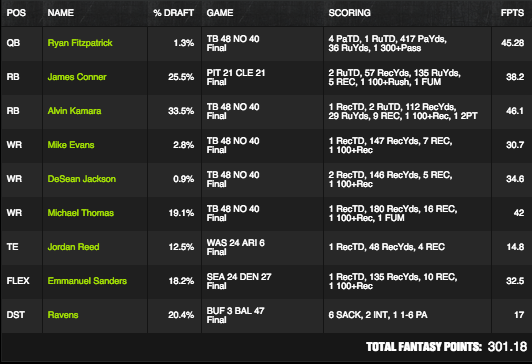 No double stacks (meaning multiple skill players alongside a QB of the same team) were necessary this week on FD. No RB/defense correlations were necessary. Only a mini-game stack combined with some of the top per-dollar values were required to take down tournaments. For Week 1, this seemed so incredibly simple, and such cannot be relied upon to hold next week. The only major injuries to dodge this week were Leonard Fournette and Marquise Goodwin and those who have played daily fantasy football know all too well that is too quiet on the injury front. 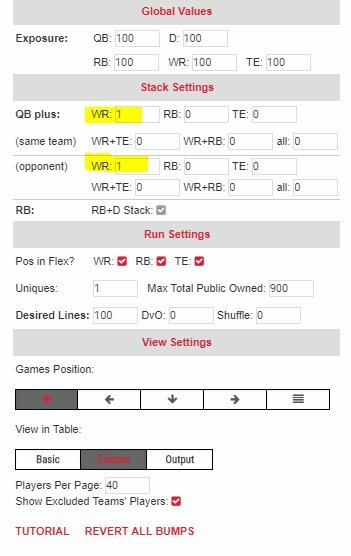 On DK, the double stack paid off as both of Fitzpatrick’s receivers were combined with the chalk defenses and players already discussed to construct the winning roster. However, “chalk” did not punt his defense like those on FD did but instead he spent all the way up for the most expensive (and highly-owned) unit! The noteworthy aspect to his ownership percentages was almost a full James Conner fade (two-percent) and yet he still had a productive week because of all the other top performers he was heavily exposed to! Normally, fading a chalk, cheap back at over 25-percent ownership would be the end but wakeywakey constructed rosters well enough to generally overcome. Just imagine how dominant his builds would have been if he would have included the Conner chalk. Whew. Congratulations to all the winners and better luck to all who did not win a million dollars next week!